Bitter cold pierced my body, it consumed my mind. I had been traveling through the snow-covered land for over four days; four days of cruel pain. Alone, I was ready to give up, to collapse in the ice, when at last I had arrived. Upon first sight of the city walls, relief swept through my battered body. The walls towered high, strong, indestructible. What lay on the inside was a new life for me. As I gazed at the outside of the city, I recalled the history of this land. They called it the greatest battle of all time. Books were written, tales were told and the legend spread throughout the entire world. On this land, before this city existed, two huge armies clashed; one hundred thousand soldiers fought for freedom. The good prevailed, and the war ended. In memory and honour of those who gave their lives, thousands of people attended an enormous requiem. The soldiers who fought for their children, and their children's children, would never be forgotten. I have been working on this map since March, and it is now the 21st December - an early Christmas present for you all! That's right, nine months in the making, and it is finally finished. I seriously can not believe it. As I have said, this map was like my ring of burden - such a massive project. I put as much detail into every little corner, I hope I didn't miss anything. In the end, I became tired and decided to fill the rest of the map with forest. So, don't say I'm lazy, or else this map wouldn't be here, now would it?! Ha! A little note about the himalayan height: I left the rainbow coloured glitch on them as it would have drastically altered the shape of the mountains if I were to fix the glitch. Therefore, I left it for the better. So if anybody gives the map a rating, please don't mark it down due to the glitch on the mountains. Remember: not everyone can be perfect. Not really sure what else to say. It's 1am here as I type this, and I'm tired. Will I submit anymore maps in the future? I've no idea. My last map was submitted in 2008, I believe, so I can't leave 2009 without making my mark. WOW!!! Thx dragonheart for this huge present!! One question: You said, you were a bit tired at last and filled the map with forest. 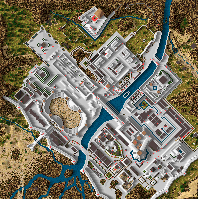 Was the first map - which was deleted earlier on your computer - including more city elements than this one, or was the first map not finished? The map is actually an Economic. finelly ithis map is out!